What is there to do in Cue? But what is there to do in Cue? Well, yes, we might be a desert town and the scenery is relatively flat and you could say it looks dull and boring, but in every direction, there are interesting sights to see, not to mention some unique animals, insects, birds and flowers you won’t see everywhere every day. In the Queen of the Murchison Guest House reception lobby you will find a brochure stand providing brochures and directions to the local sights. Or you could go to the Cue Community Resource Centre at the north end of town where locals are happy to share even more of what they know about our town and surrounding districts. We don’t win many awards for our architecture – it is from a style unique to outback towns in days gone by, but if you spend half an hour following our booklet wandering through the streets of Cue, you get a feel for how it may have been when 10,000+ people lived in tents while they search for the elusive “yella” – commonly known as gold. We have the only 2 storey corrugated tin Masonic Lodge building in the world. The Murchison Club Hotel started life as a single storey building and many years ago had a second storey added – and those rooms are still in use. 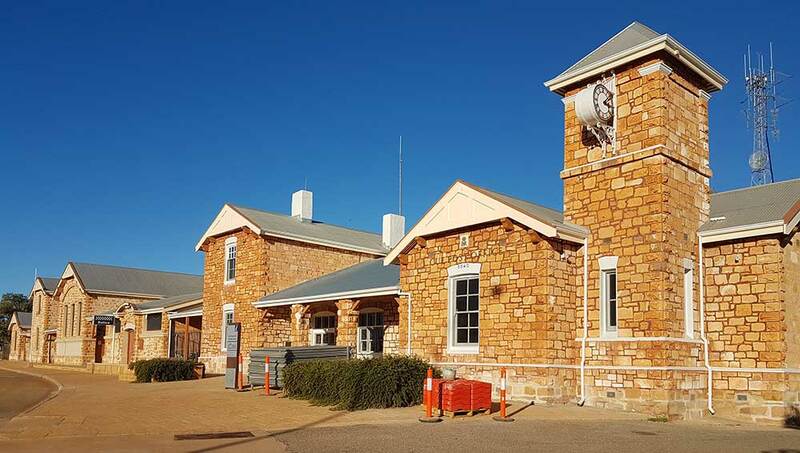 Right next door to the pub is the recently refurbished former Post Office which is now the Community Resource Centre; then still heading north is the Police Station and Courthouse which are both in very good condition and still in use. All were built of beautifully coloured sandstone in the same grand style. Our Cue Shire Council office, also at the north end of town has a magnificent collection of old photographs and we encourage you to spend at least an hour there seeing how life was lived in Cue well over 100 years ago. Our entire streetscape is from around the 1890’s and used to be occupied by an entire array of retail premises and services such as newspapers, hardware store, fruiterer, prospectors’ supplier and the old Bank of New South Wales which never held less than a ton of gold at any one time. We would love to have a couple of services such as a hairdresser and a baker join us in town. We have photographers come here from Europe who love the crisp, clean air which allows for surreal images and allows night skies to reveal millions of stars which you just can’t see if you live in a town or city. It isn’t just the smog, it’s light pollution which absorbs the starlight but we don’t have smog out here, or many lights outside the town limits, so you can prepare to be amazed at what you can see in the night sky. As an added bonus we don’t have traffic lights, traffic jams or parking meters so, all round, it makes for an easier, less stressful life. Kids been cooped in the car for hours? Take them out to the football oval – turn east at the Murchison Club Hotel and let them run around there for an hour or so (keep plenty of water up to them), or over to the west side behind the Shire Council office for the water park and playground which is very popular in the summer. The Shire has invested lots of time to create and maintain these facilities for all to enjoy – please use them. If the rains come at the right time, the huge array of wildflowers, usually in October will knock your socks off. In 2017 the flowers were so thick and stretched for kilometres in every direction that they could actually be seen from space. No, really. Don’t just drive through Cue – take a day or two to get to know us and our town. You won’t regret it. Cue is one town along the Great Northern Highway worth stopping in and getting to know the locals.